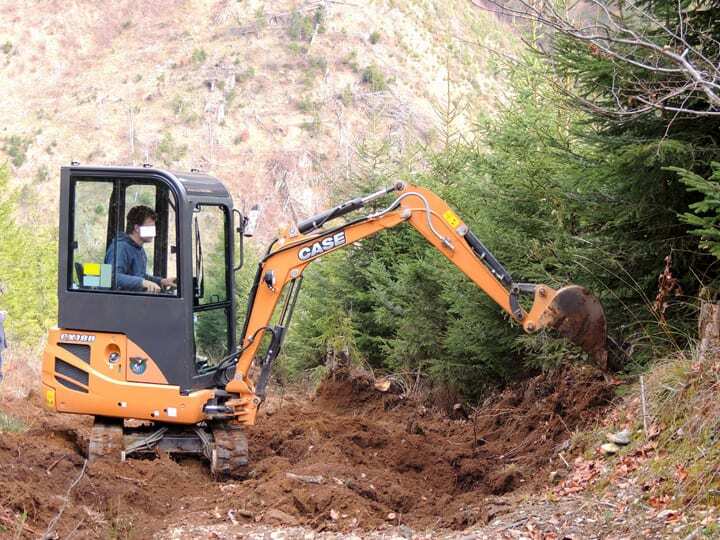 This autumn we put the acquired mini-excavator into action: operated by our new colleague Tavi, we started to work with it in Piscul Incurcat, where our team had filled the ditches and trenches manually with logs and wooden debris throughout summer. Piscul (the peak) – a sinuous ridge deeply furrowed by the marks of illegal logging, stretches right above the forest road. By leveling the margins with the excavator and landscaping the slopes, the water can run off equally and erosion will be put at halt. The excavator moves slowly, repairing about 30 m of eroded tracks per day, but has proven an excellent tool to accomplish our goals.